More than six months after production of the much-awaited Acura/Honda NSX started at the Performance Manufacturing Center in Marysville, Ohio, U.S., an example of the car was delivered to a European customer. Already available in Australia and America, and scheduled for first customer delivery in Japan on February 27 next year, the NSX reached the Old continent with a striking Curva Red body paint. 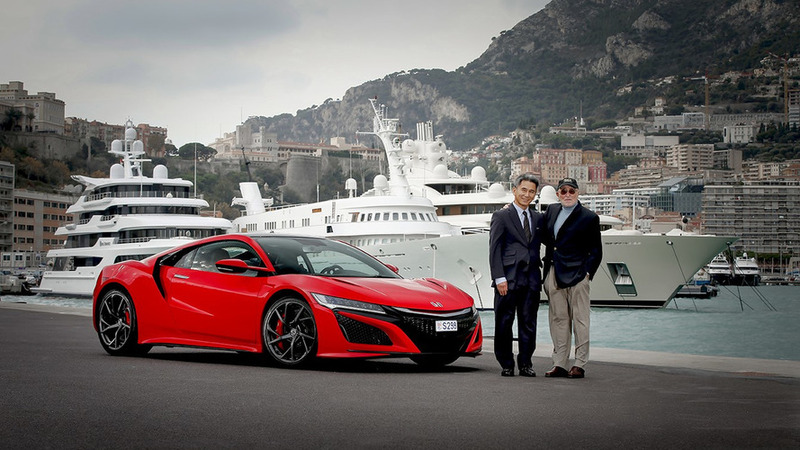 In Monaco, Taku Kasahara, branch president of Honda Motor Europe France, handed the keys of the supercar to its new owner, Honda ambassador Claude Sage who is also the founder and former CEO of Honda Switzerland, and a member of the Honda NSX & Sportscar Club. Sage is also known for his role as a development driver for the first generation NSX, and was involved in the development of the HP-X Prototype in Turin and Tochigi, Japan, before the project evolved into a production car. Currently the most expensive car manufactured in the United States, the NSX managed to fetch no less than $1.2 million USD at an auction in January this year â€“ and all the money have been directed towards the Pediatric Brain Tumor Foundation and Camp Southern Ground.